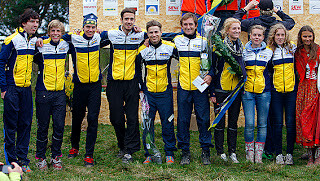 Last weekend I ran the Swedish Orienteering Championships in Middle distance and Relay, and in both races I had a good chance to win, and in both races I failed to do so. Much more difficult both physically and technically than expected. Very bushy terrain with low visibility and wet marshes made this pretty tough. I was pretty scrappy, especially early on, but held it together to qualify 5th in my heat (top 6 to the final). 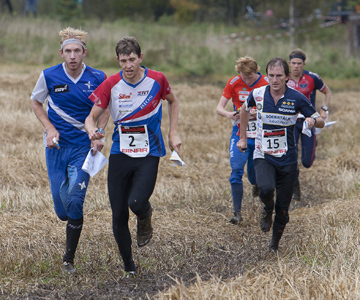 With my usual cautious start in difficult terrain, I was slow but steady initially but I caught Jesper Lysell and Petter Eriksson at the second control. I probably didn't take the best route choices to the 3rd and 8th, and at the half way mark I was about 1 minute behind the leaders. Then after passing the competition centre and taking a new map, the course suddenly got really interesting again. Petter took a couple of controls before me, and our pace increased such that at the 15th control (after 31 minutes running and 7 minutes left) I was in the overall lead by 20 seconds. Then disaster. The speed was very high across the slope to the 16th. I was a little higher than Petter but with everything under control. We came to the hill where the control should be, and for some reason things didn't quite fit what I was expecting to see. Petter turned right, but instead of checking or following him, my instinct told me I needed to go left. I did that, ran 20 seconds, realised I had made a mistake and turned around. By then it was too late, I had lost 1 minute, Petter was away to the next control, and I had missed my chance to win the Swedish champs. I even made a 15 second mistake on the next control, probably losing a medal, when I almost ran into a forbidden area and had to go back on myself. Still, it was nice to see that my shape is quite good at the moment, and that I should get some confidence in my ability. After the middle distance, it was decided that I should ran the last leg, in the SNO first team with Erik Liljeqvist and Jonas Leandersson on the first 2 legs. They both did a really good job, sending me out in 2nd place, 1 minute behind William Lind of Malungs, and just in the front of a group of another 6 runners. The first control was really long, and when we got there, the group had tightened up considerably. I was happy to let others do the work initially, but I was not afraid to do my own thing (for example the 5th control I took a different route choice to the others, and came back out with the leaders). From about the 5th control, a smaller group of myself, Lysell, Johanson, Troeng and Lind had a gap to the others, and we maintained that to the spectator control. Then there was the biggest forking so far, and I took my controls well and was able to get a small lead. Then I pushed as hard as possible across the fields and through the next few controls. At the next radio control I had a 40 second lead. I was really nervous, especially through the technical controls at the far end of the map, but I managed with only some small hesitations to get through them. I could hear the group behind me, and at the end of the loop (which was forked), I caught sight of Troeng and Lysell. Lysell caught me at the 17th and then ran behind me until the second last. I was hoping we would have a different forking in the end, but he had the same as me. Then on the way to the last control, he changed gear and gave it everything. I put everything I had left into following him, but it was not enough, and in the end he won the sprint comfortably. I managed to stay clear ahead of the chasing teams though, for a 2nd place and Silver medal - my first in Swedish Championships. I was frustrated by my mistake on Saturday, but in general it was a really good, positive weekend, and now I am looking forward to watching my girlfriend run the Berlin Marathon at the weekend, and then to a nice training camp and World Cup Final in Switzerland.